In the April Creative Club, Jane showed how to make a Pouch with a curved zipper. 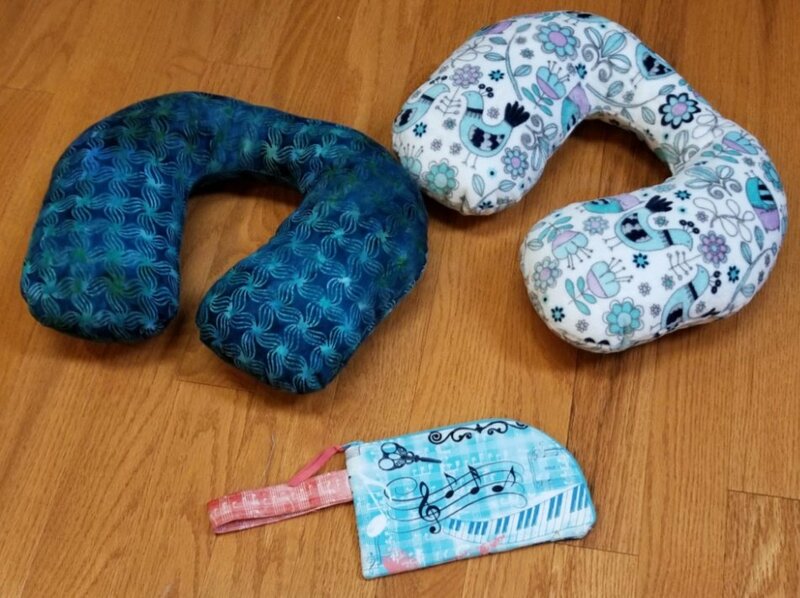 The Quick project was a Travel Neck Ring Pillow. Cute gifts for any age! Jane has been inspiring sewers for over 40 years. In her creative club she demonstrates how to create 2 projects that any machine with a zig zag can create. So many of her projects make wonderful gifts for any occasion. There will always be time for show and tell as well as answering questions. Don't miss an opportunity to come to this class each month you are able. If there is ever a time you are unable to come in person, Jane has graciously made available the instruction sheets for only $5.00. This club meets on the 2nd Wednesday of the month at either 10am or 2pm. As with all of the Neal's clubs, there is no long term commitment nor any reservations needed Just come when you are able and you can pay your $5.00 at the door. All skill levels will benefit from this club.